In honor of the Armistice, there are celebrations or memorials in the US, Poland, New Zealand, France, Belgium, the UK, and the Commonwealth, including New Zealand. It’s also National Sundae Day, even though it’s Saturday. On this day in 1675, Gottfried Leibniz demonstrated the use of integral calculus as a way to determine the area under the graph y = ƒ(x). Two people were hanged on this day: Nat Turner (1831) for inciting a slave rebellion, and the Australian “bushranger” Ned Kelly, hanged in Melbourne in 1880. I had no idea who Ned Kelly was, but his Wikipedia entry is HUGE. He must be some sort of national icon in Australia. On this day in 1864, Union general William Tecumseh Sherman started burning down Atlanta before beginning his destructive march to the sea. And, of course, on this day in 1918, Germany signed an armistice agreement with the allies in a railroad car in the forest of Compiègne, France. In 1940 Hitler, to humiliate the French, made them sign their surrender in the same railway car at the same location. On November 11, 1921, President Warren Harding dedicated the Tomb of the Unknowns in Arlington National Cemetery. On this day in 1992, the Anglican Church voted to allow women to become priests. We’re still waiting on the Vatican. . . . Finally, in 2004, Nobel Laureate and terrorist Yasser Arafat was confirmed dead by the PLO, with Mahmou Abbas becoming the PLO chairman. Note that as per my theory (whch is mine), the cat is not painted at all well, even though Monsieur Duret looks fine. Why can’t artists paint cats? Those who fell asleep on this day (or were forcibly put to sleep) include Nat Turner and Ned Kelly (see above), Søren Kierkegaard (1885), Jerome Kern (1945), Allman Brothers bassist Berry Oakley (1972), and Yasser Arafat (see above). A: We have to talk seriously. Three tw**ts shamelessly cribbed from Heather Hastie. I wonder if someone lives in that house. . . Which is the model, and which the mimic? And what order of insects is the mimic in? This is one small pig! This entry was written by whyevolutionistrue and posted on November 11, 2017 at 6:30 am and filed under Hili Dialogue. Bookmark the permalink. Follow any comments here with the RSS feed for this post. Both comments and trackbacks are currently closed. We all know here in the US what name it is given… I like to think…. Now I have to go read about why, same as with Thanksgiving every year and never get to the bottom of it. There’s something heathenish about it, this questioning of the current holidays…. It is confusing. Probably because they confiscated Armistice Day for Veterans Day around 1954. They also tried to make a normal 3 day holiday out of the thing and that really pissed off some people. So the fact that they moved it back to the proper day, Nov. 11 kind of tell us this is a WWI day and not just Vets day. They did the same thing with the Unknown soldiers grave as they now pop one in from each war. Additionally, the fact that we also have Memorial Day add more confusion. Hope this helps clear it up. Thanks. I’ll give you a “call” on the November 24th 2017 Hili Dialogue. Sort of like what’s going on here. Can somebody explain this conversation for a Britisher? Why would it not be Armistice Day? Your question “why would it not be (called?) Armistice Day?” is precisely my question too. It seems not to have a good answer. As for the request to “explain the conversation to a Britisher” – I think if someone has to do that, we’re all in a lot of trouble! When I was a boy … all the people of all the nations which had fought in the First World War were silent during the eleventh minute of the eleventh hour of Armistice Day, which was the eleventh day of the eleventh month. Wow – that is good. Thanks. … another thought occurred to me, and it sounds cynical, or something – but to name this day “Armistice Day” emphasizes – I think – peace. Not war. While naming the day “Veterans’ Day” is different : it emphasizes an important thing, the people who give everything they have in the service of … well, the United States of America, which is the only country that I think calls it “Veterans’ Day”, and that is very fine to do, and who could possibly object to that. However, and this is the cynical or whatever part : as it is emphasizing people who serve in the military, is leaves us with the notion that there is a requirement of war, conflict, and sacrifice for the sake of the country – that by speaking of “Veterans’ Day”, we are back-handedly assuring one another … what, a commitment to?… the inevitability?… of war, violence, and all that terrible stuff. You are starting to remind me of the narcissistic psychopath we have for a leader. What I cannot understand with all the stuff going on at this time, that the gutless Congress does not step up and say no to Trump and his continued march to start war with N. Korea. It is historical repetition that just keeps going around. See you on November 24th. A three story house around 800 years old. I would say they use to know how to build them. I’m guessing the windows and rain gutter were later additions. We’ll call it a fixer upper. High class housing from the dark ages. It’s a one-storey house with basement and sub-basement. Probably no internal stairs. The top picture is the model. The bottom picture is the mimic. The mimic is in the order coleoptera. It’s a thanasimis formicarius. I had seen that and someone mentioned the word beetle so I had a little help. Still somewhat difficult to confirm which was which and the specifics. At least I think that’s correct. Correct. The beetle is in the checkered beetle family, Cleroidea. I had not thought of them as velvet ant mimics, but it seems they are. I got that the mimic (bottom picture) was a beetle, but you provided a very much more elaborate answer. Thanks. The town is built on the south slope of a steep hill with a castle [also 12th century] atop the hill. I read that the overhang is to minimise tax which is based on ground floor area – I doubt it! There seems to be a few “la Maison de Jeanne”‘s dotted around France – I assume places were renamed after an 1980s film of that exact name for some reason – pour le tourisme? From that page I gather the ground floor [red double doors to the right] was the stable. The property appears to be unoccupied – it’s part of a daily, ‘cept for Wednesday, tourism board medieval walking tour with a couple of filles play acting. Ho I imagine a conversation between the owners if they were somehow whisked to modern times. I enjoy your brain Diana – you would have been at home on the Blackadder writing team! You obviously know some weird people. And not just the Uncle Herbert Fan Club here. Interesting. The tours are led by two female comics, and there’s a mystery drink at the end. Yesterday’ illustration, a painting by Hogarth, had a beautifully painted and observed cat. To be honest, I’m not seeing that the cat in today’s entry is noticeably less well rendered than Monsieur Duret, or his clothes, or the stacks of paper and other background objects in the scene. Clearly photorealism was not the point here. It may well be the case that artists often didn’t paint cats realistically, but to conclude that they couldn’t requires a showing of intent. Yeah, I agree with that judgement. I believe Atlanta was set afire by retreating Confederates commanded by Gen. John Bell Hood (of Devil’s Den renown). It is okay to believe that retreating confederates were responsible for the burning of Atlanta but it did not really happen that way. Sherman’s army is responsible for the final burning of the city and all the history pretty much confirms this. They were not ordered to burn everything, but things get out of hand when you tell a bunch of guys to do something as you are leaving. Yes, the confederates burned supplies and things left behind but they did not burn down the entire place. That was Sherman’s boys. For what it is worth, the Georgia Historical says only 40% of the city was burned, although it is unclear as to whether the 40% refers to geographic area or number of buildings. On reflection I believe that Atlanta was originally burned somewhat accidentally by Hood’s troops (they managed to ignite an armaments train) and some weeks later burned more completely by Sherman. So, has that medieval house been kept well, or was it exceptionally built? Also, since I’m no historian, I’d like someone to expound a bit on what kind of person owned such a house. Surely it was no commoner, but just how high in the feudal hierarchy was someone like the owner? I know nothing about the history of this period or place but would also be interested in learning. 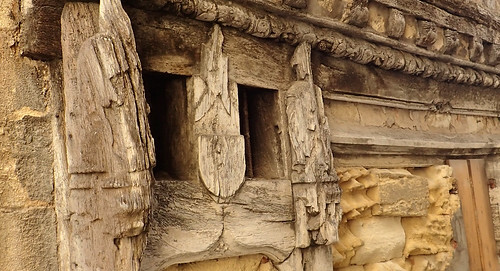 Just the idea of a house built around 300 years before Columbus is still there and standing. I know that in today’s world, houses built in Europe are much more durable and long lasting than the building in the U.S. However, 800 years is crazy. I think in Europe (and other parts of the world?) there are many houses that, or nearly that, old. Most still extant ones have been restored. Many 17th century houses in, say Amsterdam or other cities in the ‘low countries’ are medieval, but got a new facade in the 17th century. Most houses in the centre of the City of Bern date from the 12th century, but have been restored several times. Many houses in the Mediterranean are even built on original Roman foundations. I guess that what makes the house shown so special is that it has never been restored (just a guess). My reading of the structure is that at two times a roof was expanded above an earlier property. The hairpin corner allowed for encroaching on the roadway. One of the things I’ve always lamented about the US is that, it being a relatively young country in terms of development, we don’t tons of old buildings of marvelous architecture like they do all over Europe. When I visited London about eleven years ago (my first trip to Europe), the first thing that struck me was just how wonderfully different a city feels with all that history surrounding the streets. I imagine people who have always lived in such places take these things for granted. Old joke: In America, they think 100 years is a long time. In Europe, they think 100 miles is a long ways. It was probably owned by a mid-level merchant or travelling salesman. Other possibilities are senior clerk or high-level artisan perhaps. It’s unlikely to have been owned by a member of the nobility, unless he bought it to keep his mistress in. He he, keeping his mistress in? I’d guess it would have belonged to a member of a professional guild, again, that is just a guess. Members of a medieval guild can be compared to our present ‘middle class’: not really wealthy, but well off enough to live in a serious house. This is the department of Aveyron in the Midi-Pyrénées region – that’s down in the bottom right corner of France only a 100km hop from the Mediterranean. The weather is mild & fairly dry all year round – no frosts at all most years. Humans, frost & fire are the main building killers [IMO] in areas free from nature’s little quips: earthquake, flood, avalanche etc. There are aqueducts & all sorts of old stonework down that way that’s jogging along nicely after centuries. That small dept of Aveyron [only 9k km^2] has 23 surviving castles [or big houses]. The fountain in the centre of Sévérac-le-Château dates to Roman times [how is such a fountain possible 800 metres or so above the water table?]. There are Dolmens all over the dept & other signs indicating continuous occupation of the hill back to prehistory. I’ve just found out the building is suspected to be 14th century & tree ring tests will be conducted soon to ascertain an age. Architecturally this house is a right old dog’s breakfast – the top floor is colombage [Frog speak for half-timbered] which is a weight-bearing timber frame construction system of great antiquity that you’ll find anywhere that has decent trees. But the infill looks to be either stone or brick rather than cob [mixture of mud, straw, horsehair – whatever] – this is not ideal given the added weight, but it does happen – I’ve seen it in Chester which is festooned with Elizabethan wood frame houses, rubbish tea shops & stressed tourists with a camera obsession. I suspect this house has been patched up many times & some ‘genius’ decided to brick up the the bits between the frames. 4] farming for miles around presumably run on a serf system. I would suppose the castle family owned absolutely everything to the horizon & the city was for artisans, merchants & the service industry – all of whom paid rent & taxes, but probably no property ownership at all. The local big business was weaving & the ancillary trades such as dyeing. Goods were for export throughout southern France & Italy. The city was a centre for marketing & a trade hub – thus it would need food halls, stables, hostels, inns & debauchery of various kinds. Not really nicky – it’s as much me hypothesizing as you! Plus when buiders get involved logic goes out the window! I hope you is feeling better today. The inside has been restored for tourism dollars in a very dead way. Unimaginative. There’s a very strange ‘treatment’ above the fireplace that’s a travesty. Otherwise far too clean to capture the medieval era of lice, & hanging hams, almost rancid meat, dried veg [strings of garlic etc] plus I would want to see prize egg-laying hens roaming the living spaces at times to keep ’em from thieves. An antiseptic recreation as it is now. Bottom is a lovely Google maps god’s view of the castle & house with a red pin symbol on the house. If you click the brown camera symbol on the house the sidebar pops out. In the sidebar is a link to a gallery of 40 pics. You’ll note that the buildings around about have been gentrified to within an inch of their life. Some local builder married to the sister of the mayor [my made up story] has made a fortune blasting & over-pointing the local stonework. I wonder if the equivalent to Chester tea shops are shite? I bet they are. I took at google drive around the ‘city’ & there’s a cafe selling pizza… sacre blue cream de menth mon ami Rodders! When you look at people standing next to the house, it turns out to be fairly small. By gum. Looks like they’ll be stooping indoors. Good pic. I think 11-11-1975 was also the date Angola declared independence. The charming old house in Aveyron, France looked familiar. 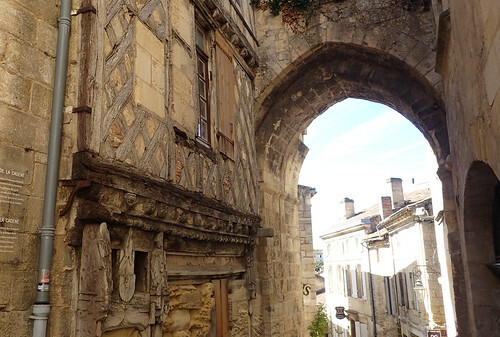 I was in the village of Saint-Émilion in September and our guide pointed out the oldest house in town. I don’t recall the construction date. I didn’t even read what these are, they are just beautiful to see in their own right. I certainly thought so. It seems to confirm continuity of aesthetic appreciation over long time periods. Another good example is the Cro-Magnon cave art found throughout southern France. Assuming the “mimic” relationship between species is unidirectional in the sense given by the usual meaning of the word, how do we determine that direction? In short, who is mimicking who? Is it based on which species takes more advantage of the other? I doubt it is by which species evolved first as it is bound to be co-evolution. Do researchers worry about the subjective nature of the decision? Or do they purposely avoid serious discussion of the direction in favor of objectivity? tI think in this particular case it is quite clear, the beetle having a kind of two-cut design on it’s hard cover wings? No doubts: the beetle is the mimic. It is a common pattern that the mimic has only a superficial similarity — a similar paint job. It seems likely that non-social insect species mimic social ones in order to take advantage of the latter’s accumulated resources. Mimicry going the other way seems unlikely. IIANM (and forgive me if you’re well aware of this), velvet ants are known for their extremely painful stings; and they have that aposematic coloring to warn you. Knowing nothing about the beetle, I’d suggest that it might have “discovered” that resembling the ant was quite beneficial to its longevity. Yes, it is easy to see which is the mimic species in this case. I should have been more clear that I was speaking of the more general issue of determining the mimic. Perhaps it is always this easy. The mimicked features are very likely to be superficial, such as a change in coloring. Behavioral mimicry must be a bit harder. I suppose in some cases there might be a difficult choice to make between mimicry and parallel evolution.